Faxes is a well known producer of quality machines for your woodhandling. Logsplitters, Logconveyors and Logcutters are the core of the companys product portfolio. Robust construction’s with high reliability and durability characterizes the company's products. All products are manufactured and developed here in Burseryd in the province of Småland. 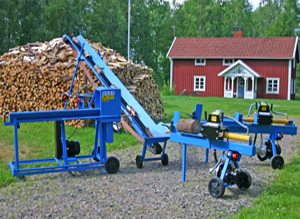 Security and usability have always come first when we develop our firewood machines. The stability and solid knowledge of the company makes that you can always feel confident as our customer.